Many argue that globalization has negative impacts on daily lives of people in the globe. However, globalisation has significantly enhanced the daily lives of people in many aspects. One of the evidence of such positive aspects can be observed through the using of internet technology in day to day interaction. Every day the using of internet technology increases by the human rights, social, political, and economic activities of people all over the world. This paper will specifically discuss the positive impacts of globalisation on Oromo community in Victoria who left their home land, Oromia, due to political persecution. First, it will discuss the importance of globalization in promoting human rights activities of Oromo community. Secondly, it will look at the positive impacts of globalisation in educational sectors. And finally, it will discuss the significance aspects of globalization in promoting knowledge and best practices among the nations of the world. One positive view of globalisation is that it enhances human rights activities among the global communities. Van Krieken et al. (2010, p. 31), defines globalisation as “the process through which an ever-expanding free flow of goods, services, capital, peoples and social customs leads to further integration of economies and societies worldwide”. This implies globalisation has ability to reach every corner of the globe with no boundaries within a very short period of time. In such highly interconnected world, the positive contribution of globalisation in promoting human rights activities is unquestionable. The Oromo community members in Victoria, for example, are living far away from their birth place. Many of the Oromo living in Victoria feel disconnected from their national cause. However, there is a deep desire to reconnect to their nation causes through using internet and social media. For instance, the editor of Advocacy for Oromia is working “to compile data of #oromoaction names, pictures, stories and full information of all the arrested, disappeared, injured, wounded and killed students/peoples, for accurate information and data uses for different references and uses. Hence, we hereby ask for your support”. Other activists are also using social media like Facebook and YouTube videos in English and Oromo language to promote human rights issues to the globe. While scholars such as Asafa Jalata is using academic books (Jalata 2010), other young Oromo intellectuals are highly focusing on using social media to address the Oromo issues at global stage. What is notable here is how Oromo activists are already exploring the positive aspect of globalisation to discourse the human rights violation of Oromo people through a fusion of global and Oromo style of activism. Undoubtedly, globalisation facilitates international exchanges of information that overcome the restrictions of a single power by allowing involvement in an international community. There is also the possibility that the power of activism can be utilized to sanction human rights violators more effectively. Another positive aspect of globalisation is the development and transformation of education system. Traditionally, education is seen as a formal process of instruction at a fixed place and time. However, technology has made an immense change in the education world. For example, the invention of technological devices helps students to learn easily through access of a full library via a mobile app or any smart phone. Before inventing this technology, both students and teachers had to go to physical libraries to get the information they need. It is in these ways that globalization is expressing itself via technology and is aiding the exchange of global knowledge in education sector. Another interesting occurrence that has emerged in many emerging communities like Oromo community in Victoria is the awareness of the importance of education for all. The role of migration is partially responsible for this increased motivation to acquire a good education at all levels. It has been reported that international organizations and global campaign for education also play “a positive role in encouraging gender equality to be a sign of progress for a nation’ (Academia.edu 2015). Thus, the era of globalisation is vastly associated with the new hope of global community in which changes and developments are fostering the education sector in all societies regardless of boundaries. It is here that education is most effectively addressing the positive aspect of globalisation. Hence, globalisation is viewed more in terms of enhancing an educational system by improving the process and mechanism of knowledge exchange. Globalisation has created a situation where knowledge and best practices are sharing without boundaries. As a matter of fact, some people blame globalisation for a decrease in cultural diversity. However, other people see it as dynamic cultural improvement and new ways of seeing the world. In this framework new globalisation is not only creating an active situation where knowledge and innovations are sharing among nations. It is also creating a shift of the very basics of human relations and social life in a positive way. Consequently, it builds a potential benefit of understanding differences as a source of social strength through knowledge and best practices sharing among nations. Many members of Oromo community in Victoria, for example, agree that in their refugee journey and life it was almost impossible to share knowledge effectively and efficiently with others. However, they believe that the technological advancement have made the knowledge and best practices sharing a reality in their new home. Therefore, the positive aspects of globalisation can be observed in ‘a successful use of internal communication strategies and techniques, which includes also knowledge sharing and building knowledge sharing culture, is essential for excellent performance and success in the increasingly complex and highly competitive nature of today’s environment’(International School for Social and Business Studies 2011, p. 231). Generally, globalisation has many positive aspects that can enhance human development, education and knowledge sharing in many ways. Today human rights have become an essential part of the process of globalisation. 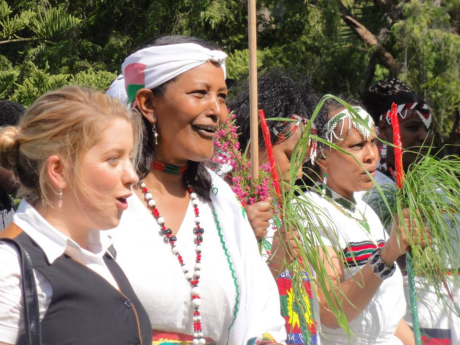 Hence, globalisation is a wonderful opportunity for the small communities like Oromo community in Victoria to promote Oromo human rights issues to the global world. There is an indication of increased participation of international actors like Amnesty International to expose the human rights violations in Oromia. Globalisation is also a very real occurrence that is transforming the global education system. With the emergence of a new technology, particularly in the highly industrialised world, knowledge takes on increasing importance. It has the potential of making societies richer through knowledge and resource sharing, and creates knowledge and understanding to people around the world. Thus, the era of globalisation has many positive outcomes associated with technological advancement. 1. Academia.edu 2015, Effects of Globalisation on Education, Viewed 29 April 2015, <https://www.academia.edu/6755602/Effects_of_Globalisation_on_Education&gt;. 2. Advocacy for Oromia 2015, Action, viewed 02 May 2015, <https://advocacy4oromia.org/action/&gt;. 3. Cogburn, L. 2012, Globalisation, Knowledge, education training in the information age, viewed 02 May 2015, <http://www.unesco.org/webworld/infoethics_2/eng/papers/paper_23.htm&gt; . 4. Jalata, A 2010, Contending nationalism of Oromia an Ethiopia: struggling for statehood, sovereignty, & multinational democracy, Global Academic publishing, New York. 5. Justinek, G & Sedej T 2011, Management, knowledge and learning, viewed 27 April 2015, <http://www.issbs.si/press/ISBN/978-961-92486-3-8/papers/ML11-25.pdf&gt;. 6. Van Kriekan, R et al., 2010, Sociology/Robert van Kriekan, 4th edn, Pearson Australia, Frenchs Forest, NSW.